The “double data” promotion that has taken the Verizon non-unlimited world by storm this morning is most definitely the real deal. Big Red will launch the new offer tomorrow to give users without unlimited plans, the chance to double up on their current data tier. 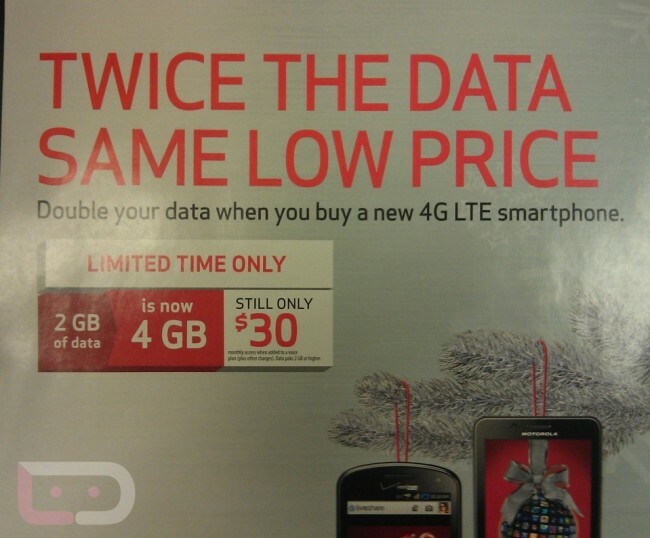 For new 4G LTE customers specifically, you will be able to double on the 2GB and 5GB plans to 4GB and 10GB respectively, without having to pay more (as is seen in the sign above). If you are a current customer that has the 2GB plan for $30, all signs also point to you being able to double your plan without paying extra. Customers can either call customer service or login to their VZW accounts to make the change themselves. The change will not happen automatically. No word yet on how long this promo will last, so if you are a current customer without unlimited data, you may want to get doubled-up in the next couple of days to make sure. For those of us that are still on an unlimited plan, gives yourselves a fist bump for being awesome. Monday Poll: Now That All Three Have Been Announced - Galaxy Nexus, Rezound, or RAZR?